Lima 2400 wore crawler shoes up to 63 inches wide on its 25-foot-long crawler assemblies. Standard dragline buckets up to 8 cubic yards could be swung on a 120-foot boom. Before the era of hydraulic excavators, contractors and surface mining companies could choose electrically powered or diesel-powered cable excavators when they needed big digging machines. In the electric field, choices were numerous as nearly all machines with dipper sizes 5 cubic yards and larger were supplied with electric power as standard. Electric machines were cheaper to operate over the long term when huge quantities of material had to be moved. But their main disadvantage was that an expensive power distribution network had to be established, and the machine's mobility was hampered by its power cable. These disadvantages opened the door to a niche market for diesel-powered machines. Enter the Lima 2400, a diesel excavator of 6- to 8-cubic-yard capacity, a size not offered by the leading excavator builders. In fact, the 2400 had only one competitor, the Manitowoc 4600. The Lima 2400 enjoyed the freedom and mobility of its diesel power, not tethered to a power cable as most of its electric counterparts in that size range. It was ideal for mining companies wanting to exploit small coal leases to fulfill short-term coal supply contracts, or to employ in large surface mines where a diesel machine could extract isolated pockets of mineral remote from the mine's electrical network. It was also well-suited for aggregate production and major earthmoving contracts such as canals, hydroelectric power projects, and large rock cuts on highway construction where mobility was key. 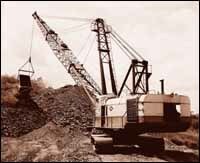 Another major factor in the Lima's success was its capability to convert quickly from shovel to dragline. Many also operated as heavy lift cranes or with clamshells. The big 2400 was a heavy-duty machine in every respect, some say over-designed. But that's probably what contributed to its reputation as a tough, reliable digging machine. As a 6-yard shovel it weighed 218 tons, and the 4-yard high-lift version with 67-foot boom tipped the scales at 250 tons. Crawler shoes of 55 inches or 63 inches wide were carried on the 25-foot-long crawler assemblies. Standard dragline buckets up to 8 cubic yards could be swung on a 120-foot boom. A Caterpillar D379 developing up to 547 flywheel horsepower supplied the diesel power. Introduced in 1948, the Lima 2400 was designed by the Lima Locomotive Works of Lima, Ohio, famous for its railroad locomotives. It followed a succession of Lima cable excavators first launched in 1928 after the company purchased the Ohio Power Shovel Co. The 2400 became one of the most successful models produced by the company with more than 650 shipped to customers around the world. It reigned supreme for more than three decades, serving the small to medium surface mines in America's Midwest and taking part in some of North America's largest construction projects, such as the St. Lawrence Seaway in Quebec. Some 72 were shipped to the United Kingdom where the 2400 became the backbone of the opencast coal-mining industry until the mid-1970s. After several changes of ownership, and a name change to Baldwin-Lima-Hamilton Corp. in 1950, the company became part of the Clark Equipment organization in 1970. In 1969, an upgraded 2400B model appeared that sold well until the Lima plant closed in 1981. You can read more about the evolution of construction equipment in Keith Haddock's illustrated book "The Earthmover Encyclopedia," available in most bookstores. Also, consider a membership in the Historical Construction Equipment Association, www.hcea.net.